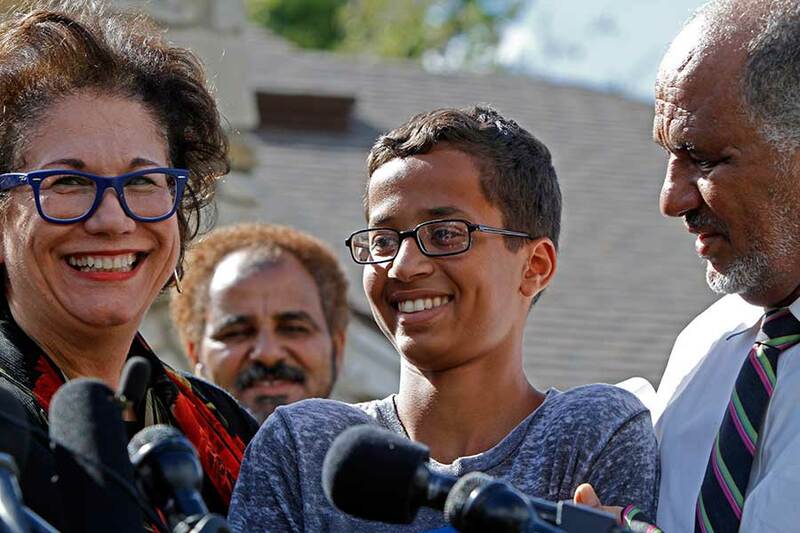 Irving, Texas – The week started pretty rough to Ahmed Mohamed, 14, a MacArthur High School student at Irving, Texas, after a teacher thought he was carrying a bomb when he actually had elaborated from scratch a home made clock. Ahmed, who is a Muslim, proudly claims that he builds his own radios and repair his own go-kart. He sleeps with a box of circuits boards at the feet of his bed and, while in Middle School, he belonged to the robotics club. Later that day, Ahmed followed his engineering teacher’s advice and kept the clock in his bag. But then, another teacher began to complain that something was beeping in class, so Ahmed showed her his ultimate invention. She asked him to give it to her as it looked like a bomb, but Ahmed refused to. After that it just went all wrong. The police arrived and pulled Ahmed out of his sixth-period class, handcuffed, and then questioned him in a schoolroom full of police officers. His parents were not contacted and the cops kept telling him he was under arrest. He was then released, and got suspended from school for 3 days. According to the authorities, the real concern was “what was this thing built for?” However, the real question here to make is, Why does this kid have to explain a clock? After the news were released, the young boy’s face was all over traditional and social media. He has received thousands of tweets and Facebook posts as support for what happened. The hashtags #IStandWithAhmed and #EngineersForAhmed were created by Twitter users from around the world and reached thousands of tweets about the event. Leaders at Reddit and Twitter have offered him internships. Facebook founder Mark Zuckerberg invited him to visit the company’s headquarters. “Having the skill and ambition to build something cool should lead to applause, not arrest. The future belongs to people like Ahmed,” Zuckerberg posted on his social network. Finally, Google executives have reserved a spot for Ahmed at their weekend science fair and MIT asked him to visit its campus. Two colliding Black Holes: The end of the universe?